How to Use Google Font API on Blog CSS? 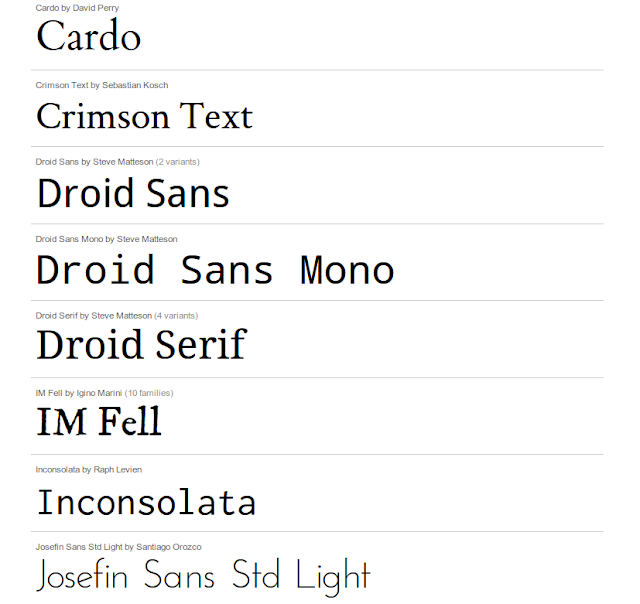 What is Google Font API? The Google Font API helps you add web fonts to any web page. It means you dont need to install font family on your desktop computer to see custom font on any web. A choice of high quality open source fonts. We can apply this font on web without install it on our PC, even our visitor can see it because we use font and script from Google Directory. Yes, Google have created Google Font Directory. There we can browse this catalog of available fonts, learn about the font designers who created them, and copy the code required to use them on our web page. The fonts in the directory are all released under open source licenses; you can use them on any non-commercial or commercial project. Now, we can use this unique font on our website or blog. How to use Google Font API ? For reference, you can read this Quick Start example or follow this example. Note : Change Font name as your desire or you can pick this code from Google Font Directory. For exampale if you want to use Yanone Kaffeesatz font, go to Google font directory, click on font type, then click on Get Code. I try to use custom font for my post title as you can see it. I think this is a great idea especially for everyone who concern on blog design and appearance. Thanks Google. This will work in blogger template, correct? Nice fonts. I'm thinking how to do it in Wordpress. mo nanya dunk, kl google font directory bisa nya d buka pake program apa? emng begitu, ataw saya yg salah yah? Cool... I'll try soon, thanx. mo nanya lg dunk, spesifikasi paste yg step 1 itu d sebelh mana yah? head yg paling ats bgt atau yg tengah2..
Ty, i will mention that with a link back to your blog. Great post, and congrats for Google! Thanks for teach me as a newbie in blogging design! Very nice post. Get Amazing usefull blogger widgets and install easily in your blogspot. Google fonts is useful for web design. i dont know how to change the font at my page..
even i already add the link to my CSS.. but i doesn't work.. Very nice illustrations or photos, I need these kind of people ! I became a number of them liek regarding referring to you ought to look. Hey there to get the best french, I'm certainly spanish. Thanks for this kind of nice post. I found your blog on google while looking for furniture and your post looks very interesting to me. Thanks a lot for saying about useful info. It necessary to understand that mobile apps development could help in your mobile industry by installing customized software apps. Wow, Great post,Nice work, I would like to read your blog every day Thanks. I have hunting it for a long time. So happy I got it today. I hope that our owners can share more good things with us. Thanks for nice info. Let me mention about cheap home insurance that are from homeowners insurance agents. Save on free rates on homeowners insurance. Thank you for writing this great posts. You have affordable possibility to clarify gaming affiliate. The most common casino programs such as go wild affiliates and great poker rooms such as redbet. Coach outlet online Leading American designer and maker of luxury lifestyle handbags and accessories.Large market in Europe and Canada,UK,USA etc.Welcome to Order!2011 New Style arrive,Free Shipping! as luxury and fashion inspires art, Coach Factory Outlet." in the Coach Outlet role of impotent bystander,among the 17 countries that use the euro,matter what happens at the European summit meeting on.